If you need golf balls and like the idea of saving around 50% on top balls like the Titleist Pro V1 and Pro V1x, TaylorMade, Callaway, Bridgestone, Nike, Maxfli, Wilson, Top Flite and more, we've got the largest collection of discount golf balls found anywhere. Here you'll find cheap golf balls, practice golf balls and bulk golf balls. How about buying three-dozen Pinnacle Mix Golf Balls, regularly priced at $29.99, on sale for $6.65? That's more than a 75% discount! And the deals don't stop there. Whether it's bulk golf balls or your own logo golf balls for that special, personalized touch, we mean it when we say, "From beginner to pro, you're gonna save dough." For even greater savings, especially if you're one who rarely gets through a round without losing one or two, you might want to try some refinished golf balls from Titleist. One of the newest and hottest balls in Golf! Hot Yellow high visibility Fun Pattern that's been a hit! Pro V1x - More spin & higher ball flight #1 ball in Golf - New in Box 5 Layers. Zero Compromises. BOLD MATTE Orange Cover The lowest compression golf balls ever made... Price includes your Logo! 4 Sleeves per box 3 dozen ball special! - #1 ball in Golf 36 Dozen or 144 sleeves of golf balls - Perfect for your next event. 3 dozen ball special! one of our best deals! 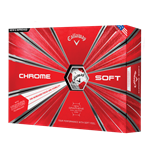 Price listed per dozen - 3 dozen for $23.85 Callaway Golf is a tradition of confidence backed by science-based performance.